When it comes to offering amenities to MacDonald Highlands residents, what could be more prestigious than a world renowned golf course and country club in their backyard? Our very own DragonRidge Country Club and DragonRidge Golf Course is one of the luxury amenities our residents enjoy. What more can you ask for when you live a Life at the Top? 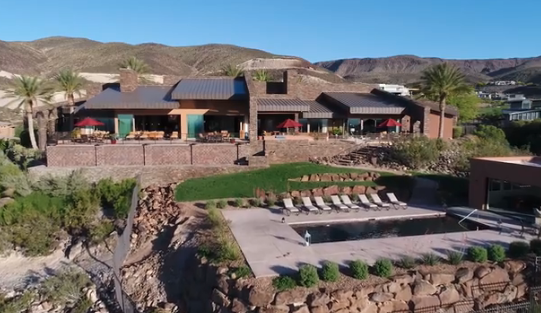 Residents of our luxury home community not only benefit from the extraordinary views of Las Vegas, but they also have full access to the world-renowned DragonRidge Golf Course and the DragonRidge Country Club. Who needs a gym membership while living in MacDonald Highlands? We offer our residents a tennis and athletic center to use freely. There, residents have access to personal trainers and fitness instructors ready to help you get— and stay—fit. Our 14,000-square-foot facility houses the latest in cardio and weight machines, a child care center, and an Internet cafe. We also offer fitness classes, including Pilates, cycling, and kickboxing. Our facility also houses five tennis courts; one even has stadium seating. Skip hosting large gatherings at your luxury home, and host them at the DragonRidge Country Club instead. Our MacDonald Highlands clubhouse is accessible to our residents for social events. The top-rated Montrose Steakhouse, Onyx Bar, Dragon Grill, and a ballroom are all located in the clubhouse. Quality restaurants and a great social venue within your own home community—what more could you ask for? Become a Resident of MacDonald Highlands Today! From our residential amenities to our views, who wouldn’t want to live in our luxury home community? MacDonald Highlands is a prestigious home community offering only the best to our residents. View our real estate options to get you a step closer to a Life at the Top!